We visited a friends farm recently and came back loaded with farm fresh vegetables. I plucked a few tender bitter gourds off the vine keeping in mind a favorite recipe that calls for slender gourds. 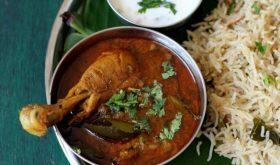 The recipe in question is an Andhra classic – Gutti Kakarakaya. Its a simple dish and my favorite go-to recipe for special occasions. The roasting process intensifies the flavor of the stuffing while charring and softening the bitter gourds. 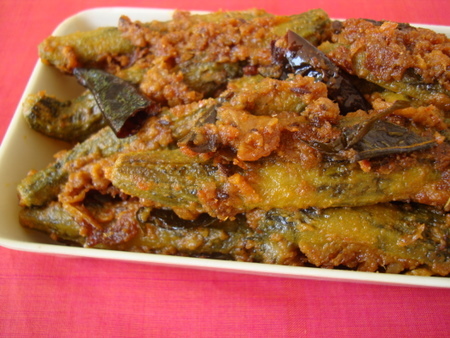 The unmistakable bitterness of kakarakaya is balanced with the spiced, tangy-sweet stuffing comprising of onions, garlic, jaggery, tamarind and red chilies. 2 Prepare the stuffing by heating a tsp oil in a cooking vessel, add garlic and cinnamon stick and saute for a few seconds. Add the sliced onions and saute till rawness disappears. Approx 4 mts. Keep aside to cool. 3 Once cool, make a coarse paste. Remove the paste into bowl, add salt to taste, red chilli pwd, jaggery, coriander pwd, cumin pwd and methi pwd. Combine well and stuff the bitter gourds with this paste. 4 Add the remaining oil in a vessel, add curry leaves and toss them for a few seconds. Add the methi seeds and let them turn brown. 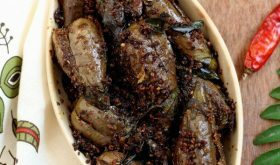 Place the stuffed bitter gourds in the oil along with any left over stuffing and cook on medium high flame for 2 mts. Now, cover with lid and let them cook on medium low flame for 15 mts. Keep checking in between and stir fry to ensure they don’t burn or stick to the pan. 5 Add the tamarind extract along 1/4 cup of water. Reduce flame and place lid and cook over low flame for another 10-12 mts. The water content should reduce. Remove lid and cook over low flame and let the bitter gourds roast well and it appears like a dry saute (mudda kura). It should take about 8-10 mts for them to be well roasted. Turn off heat. Awesome recipe as usual sailu!!! why should we put in buttermilk?never heard of this—can u plz let me know? 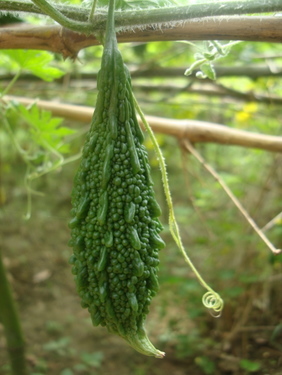 To remove bitterness of the bitter gourd. Its optional, though. You can use the gourds right away for stuffing by skipping the step of soaking in buttermilk mixture. Very nice recipe. 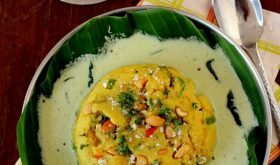 I generally dont like bittergourd but after reading this recipe, I want to try out this dish. Lovely photos, as usual. Wow wat an irresistible stuffed bitter gourds..yumm! 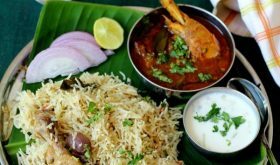 Wonderful recipe sailu garu….The pics that you post for any recipe are just awesome. hai sailu garu, chinna kakarakayalu dorakkapote peddavati to ela cheyyocho cheppandi please. recipe chaduvu tuntene tempting ga undi.. 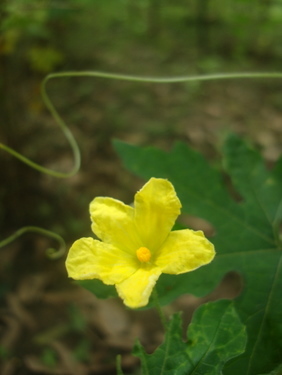 Try to use tender, slender bitter gourds as far as possible. If not available, you can use slightly mature bitter gourd by following the same procedure. Just remove the seeds. in step 3 how do you make a coarse paste of this partially done seasoning. i mean what do you use for that? I use my Sumeet blender (small jar) to make a slightly coarse paste. To this ground paste, add salt, chili pwd and rest of the spice pwds and that is the stuffing for bitter gourds. hope things are fine with you. waiting for ur recipes since a long time. this is one of my fav, going to make tomorrow. Hi Sailu, i’m punitha from Chennai. Your bitter gourd recipe looks yummy !!!!! LOVE your recipes! They are simply authentic and delicious! 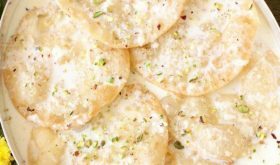 Growing up Andhara I did not learn these from my mom but crave the food now! :-) Thank you! Mmmm…. looks yummy. I know only one recipe with bitterguard, the deep fry. Have to try this new version. Thanks Sailu…you are awsome. sailu garu me vantalu chala baguntayi!!!!!! !